Let’s be frank, the Yankees have fallen short of what they are really capable of these past couple of weeks. In their last 21 games, the Bombers went a decent 11-10. Although that is above .500, it is not enough to earn ourselves first place. With the third best record in baseball (62-34), the Yankees are 5.5 games back of the white hot Red Sox. It doesn’t feel as if the team has been slumping because some of their wins were done so by insane margins and the team had faced decent competition in the last 20 games. However, watching them play tells a different story. Some of the bats have been hot as of late, in particular, Giancarlo Stanton’s and Aaron Hicks’s, but the biggest problem comes when the Yankees are faced with runners in scoring position (RISP). Take this into consideration, when the Braves came up to the Bronx, the first game was taken by Atlanta in extra innings by a score of 5-3, suffering a 2-run homer to the young Ronald Acuña Jr. Throughout that entire contest the home team had 12 opportunities to drive home runners that were in scoring position and they failed. Every. Single. Time. The same situation had occurred throughout the Orioles series and the Indians series. Countless amounts of runners are being left stranded 90-180 feet from the plate and it is costing us games. Even last night, in an impressive 5-run showing, the Yankees stranded 14 on the base paths in a loss to the rival Mets. The bats need to start rolling in clutch situations if they want to start chipping away at the 5.5 game deficit. Another problem that’s been noticed during the Yankees’ semi-slump is the starting pitching. It is no secret that the Yankees do not have the best rotation in baseball, but there has to be some discipline up there on the mound. Domingo Germán allowed 6 earned runs against the Indians the other day, stranding his team to fight for runs against the excellent Shane Bieber. German followed this with a 3.2 inning 4 run performance, which got him sent to Scranton for the, not much better, Luis Cessa. Sonny Gray has been an issue for the entire season and it is tough to watch him do so poorly because his potential is understood across the league. Other than those two spots, the rest of the rotation looks pretty solid, Sabathia has been reliable, given his age, and Tanaka could be better but has proved himself enough to earn a secure spot in the rotation. Luis Severino has, obviously, been lights out for the organization and is my top pick for the AL Cy Young award. How can we get better? 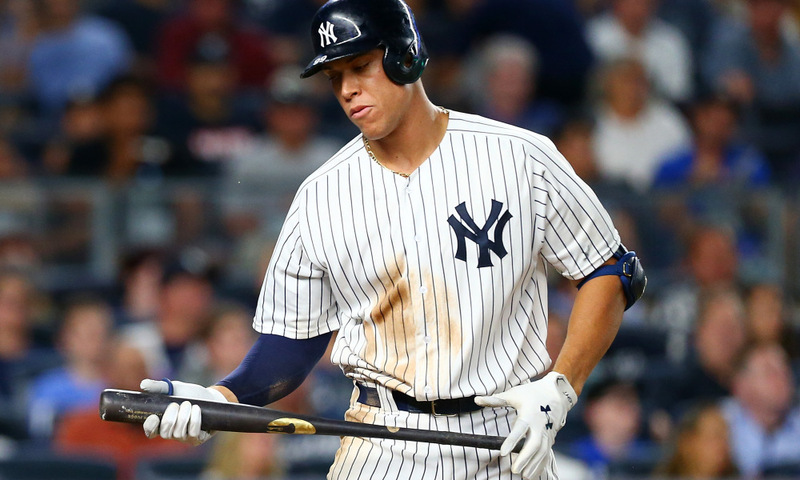 Former Yankee veterans need to have a sit down with the young stars of the organization and have a talk about ‘what it means to be a clutch hitter’. We have a lot to look forward to during the second half. Gary Sánchez is going to be making his long awaited return, the trade deadline is coming up and I have no doubt in my mind that Cashman is going to be making some phone calls, the rest of the tail end of the rotation will hopefully have a good series against the little brother from Queens which could possibly spark a rhythm from them. Don’t lose hope fans. There is plenty of baseball to be played and a big series against Boston towards the end of the season that both fanbases would be looking forward to. Andre: New York Yankees OVER 2.5 Extra Base Hits.